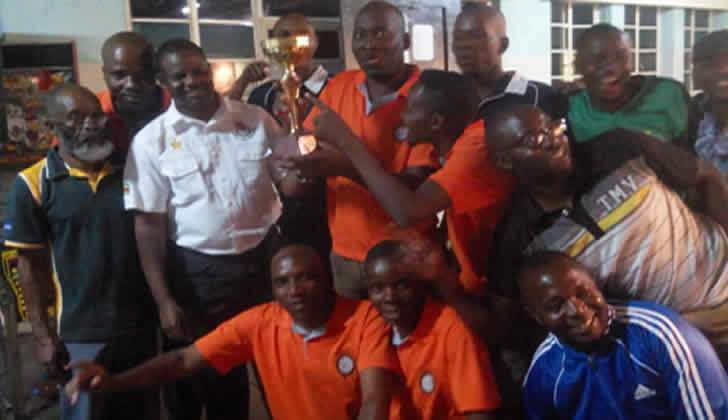 Strikers Darts team in jovial mood after winning Jewel Cup with -Left to Right H.D.A Chairperson Mr. Chiwaridzo in spectacles and Jewel Cup Sponsor Mr. Meynard Moyo in white shirt. Captain Boydo holding trophy with rest of the team. HARARE - The 2018 edition of the Jewel Cup held at the weekend at Highfields Canteen did not disappoint as Harare Darts Association top teams faced each other for the umpteenth time in the tournament. This year format of the darts Jewel Cup was hoisted on a single day as opposed to knockouts in the previous years, to minimize on expenses as the tournament was held when prices of most goods and services have gone haywire. Harare Darts Association like any other entity were caught up in the web of high prices of medals and other darts accessories. Teams attendance was also affected as half of the teams failed to attend the darts tournament .Despite the absentees, the tournament lived up to its billing as Harare's jewel tournament as the top four teams in Harare's darts league pitched to square off for the prestigious trophy at the moment. Two time winner of the cup with two different teams Leo ‘Chitarafu' Mabharani said, "There is nothing that can stop me from laying my hands on this cup for the third time with my team, I do not see any challenges all the way up". The experienced player had first lifted the cup with the defunct Kutsaga and won it again while playing for Redseal darts club. Teams were drawn in two groups of four teams each and played in a round robin format to eliminate two teams with the remaining two teams proceeding to the semi-finals. Perennial league contenders Flying Eagles were drawn in the same group with 2017 league winners Railton and narrowly scrapped through. It was in the semifinals were the big guns met with Flying Eagles playing Strikers Darts while in the other semi- final berth Railton played Jewel Arrows. After going pound for pound in the semi-finals it was left for Railton and Strikers to play it out in the finals as Flying Eagles and Jewel Arrows stumbled in the semis and had to play it out in the 3rd and 4th position. Waiting on the sidelines were perennial finalists Strikers darts club captained by veteran darts player Collen ‘Boydo' Maenda .The youthful Strikers darts team comprising of Kudakwashe Tore, Godfrey Tore, Felix Mauye, Silvester Chipuriro, Oweback Chisvo, and Ignatius Hodzi showed character and prowess and prevailed against the Railton team fronted by veterans, Mabharani Leo and Tobias Mavima. The game had to go to the wire to decide a winner as Railton refused to let go without a fight. Man of the match Kudakwashe 'Prophet' Tore did not drop a single game in all the matches he played up to the final. Strikers won the trophy for the first time after playing second fiddle to other teams in two consecutive finals. For winning the Jewel Cup Strikers got a trophy and prize money. The team players Felix ‘Magic' Mauye, Kudakwashe ‘Prophet' Tore and Oweback Chisvo got prizes for highest closed number and most 180s hit at the tournament. Jewel Cup is Harare Darts Association‘s oldest tournament and is sponsored by Mr. Meynard Moyo who is the National Darts Association of Zimbabwe President and Region 5 Secretary .Speaking on the sidelines of the tournament he said, "Jewel Cup tournament will live as long as l live. Those who love darts should play this beautiful game and I will be there to support you".